Fat loss can have a range of health benefits including enhanced energy, improved cholesterol, better blood sugar control, and most obviously how you look and feel. Thermotide® is for people aiming to reduce body fat and develop a lean toned look. Thermotide® has a unique formulation of Capsiact®, highly potent green tea extract, a tyrosine matrix, and caffeine that may increase your metabolism and stimulate your body to expend more energy. Thermotide® contains Capisact®, a high quality capsicum 95% capsaicinoids extract (14.4 m SHU). When consumed these capsaicinoids naturally raise the rate of metabolism and stimulate your body to expend more energy through heat generation (thermogenesis). Thermotide® contains the finest quality high strength (900 mg per daily serving) green tea extract containing 98% polyphenols, 70% catechins & 50% epigallocatechin gallate (EGCG). There are numerous studies that suggest green tea can benefit your health and may help to improve body composition. Caffeine: Thermotide® contains added caffeine to blunt the feelings of hunger and to achieve further increases in metabolism for greater fat burning properties. Caffeine can help with fat loss by mobilising fat from adipose tissue and making it freely available to be used for energy. Taking Thermotide® before exercise will not only give you an extra energy boost it will also result in more fat been used for energy during your session. Green tea extract: Green tea has many health benefits such as beneficial effects on metabolism, anti inflammatory properties and aiding in fat loss. The main beneficial components in green tea are theanine, gurana, polyphenols and catachens which are powerful antioxidants. Thermotide® works best when combined with an appropriate exercise regime and a nutritious calorie controlled meal plan. 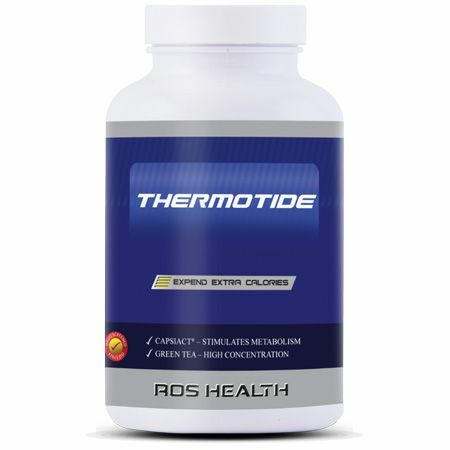 Thermotide® is a registered trademark of ROS Nutrition Group Limited. 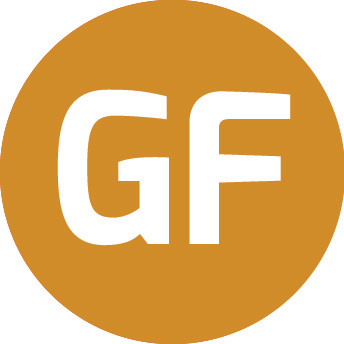 g = gram, mg = milligram, µg = microgram, 1 mg = 1000 µg, % = percentage, EU RDA = European Recommended Daily Allowance. Ingredients: Green tea 98% polyphenols / 70% catechins/ 50% ECGC P.E., L-tyrosine, N-acetyl L- tyrosine, tyrosine ethyl ester HCL, caffeine anydrous, L-arginine pyroglutamate, nicotinamide, thiamine hcl, pyridoxine hcl, ACTAMIDE®, riboflavin, chromium picolinate, cyanocobalamine, CapsiAct® (capaicin 14.4 million SHU), folic acid, D-biotin. Other Ingredients: Microcrystalline Cellulose, Magnesium Citrate and Silica. Astrup A, Toubro S, Cannon S, Hein P, Breum L and Madsen J. Caffeine: a double-blind, placebo-controlled study of its thermogenic, metabolic, and cardiovascular effects in healthy volunteers. Am J Clin Nutr 51: 759-767, 1990. Costill DL, Dalsky GP and Fink WJ. Effects of caffeine ingestion on metabolism and exercise performance. Med Sci Sports 10: 155-158, 1978. Lejeune MP, Kovacs EM and Westerterp-Plantenga MS. Effect of capsaicin on substrate oxidation and weight maintenance after modest body-weight loss in human subjects. Br J Nutr 90: 651-659, 2003. Snitker S, Fujishima Y, Shen H, Ott S, Pi-Sunyer X, Furuhata Y, Sato H and Takahashi M. Effects of novel capsinoid treatment on fatness and energy metabolism in humans: possible pharmacogenetic implications. Am J Clin Nutr 89: 45-50, 2009. Take 1 capsule three times a day, one in the morning, one in the afternoon and one before your exercise session.